First Air Boeing 737-400 New Colors for the FAIB Boeing 737-400 Logolight FSX base model. 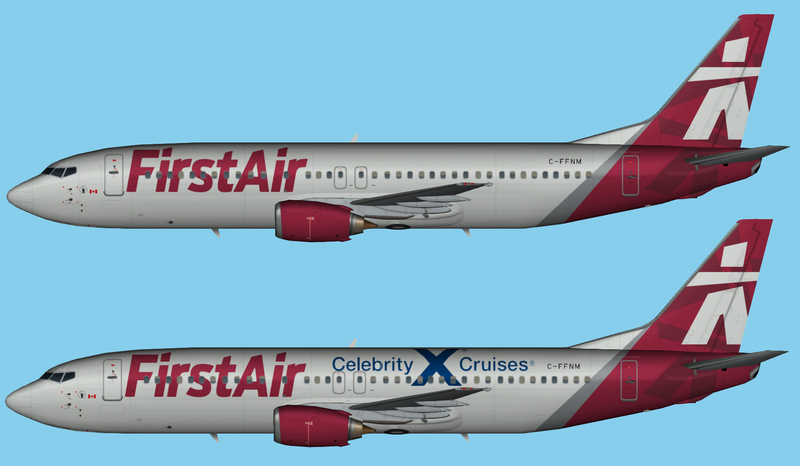 This includes the same registration with and without the “Celebrity X Cruises” logo. This is made so if/when the Cruises sticker is removed, I don’t have to update the repaint. These are FSX textures only. The FAIB Boeing 737-400F Logolights FSX base model is required. First Air Avro RJ85 opb Summit Air for the FMAI British Aerospace 146-200 / Avro RJ85 base model. These are textures only. The FMAI British Aerospace 146-200 / Avro RJ85 base model is required. It can be found at flightsim.com. Search for ai_b462.zip.